Khashoggi Killing Was Premeditated, Saudi Arabia Now Says The Saudis have changed course again on what they say happened to Saudi journalist and U.S. resident Jamal Khashoggi, who was last seen alive walking into the Saudi Consulate in Istanbul on Oct. 2. Officials stand outside the Saudi consulate in Istanbul, where Saudi journalist Jamal Khashoggi was last seen alive. Saudi Arabia's public prosecutor said Thursday that the killing of Saudi journalist Jamal Khashoggi in their consulate in Istanbul was premeditated, reversing course yet again on the Saudi account of what happened. Khashoggi was last seen alive walking into the consulate on Oct. 2, and Saudi Arabia initially denied any part in his disappearance. Last week, its government changed its story, saying the U.S. resident and critic of Saudi policy had died in the consulate because of a fight. Turkey had been especially skeptical of that claim, and Turkish President Recep Tayyip Erdogan stated earlier this week that Khashoggi was "brutally murdered" in a Saudi operation, as NPR reported. According to the Saudi state news agency, the Saudi public prosecutor said Thursday that it received information "from the Turkish side" during a joint investigation that "indicates that the suspects in the incident had committed their act with premeditated intention." "The Public Prosecution continues its investigations with the accused in the light of what it has received and the results of its investigations to reach facts and complete the course of justice," the official news report reads. The report provides no further details about the information that led to this conclusion, nor does it say whether the "premeditated" killing happened under orders from the Saudi government. Saudi Crown Prince Mohammed bin Salman and Erdogan spoke on the phone Wednesday, according to Turkey's state news agency Anadolu, and "discussed the joint efforts to uncover all aspects of the murder" of Khashoggi, including next steps. The crown prince reportedly requested the call. Turkey continues to investigate Khashoggi's death. 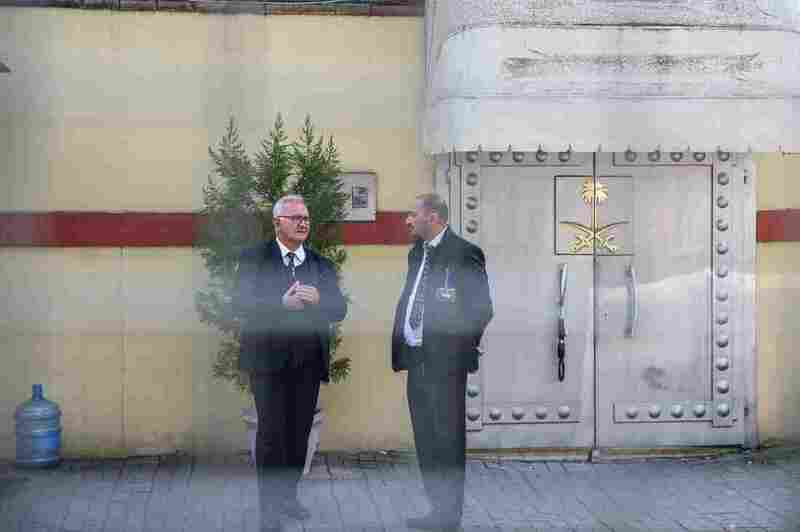 The pro-government Yeni Safak newspaper reported Thursday that Turkish security forces were denied access to search the consulate's garden and well, but they were able to obtain water samples from the well. In the U.S., CIA Director Gina Haspel returned from a trip to Turkey and was expected to brief President Trump on Thursday morning about developments in the Khashoggi investigation. The Washington Post and Reuters, citing unnamed officials, say Haspel listened to audio evidence of the killing during her trip. The CIA declined to comment to NPR about the report. Also Thursday, news emerged that Khashoggi's eldest son, Salah, and his family were able to leave Saudi Arabia, according to Human Rights Watch. He had reportedly been under a travel ban. "Good news for a change: confirming that #JamalKhashoggi son Salah and his family are finally out of Riyadh and on their way to US, travel ban lifted," tweeted the rights group's Middle East and North Africa Executive Director, Sarah Leah Whitson. Two people "close to the family" also confirmed their departure to Reuters. Khashoggi's son recently met with the crown prince, and photos of their encounter gained attention on social media. Salah is shown gazing icily at the crown prince and extending his hand. On the left, Jamal Khashoggi’s son Salah. On the right, Saudi Crown Prince Mohammed bin Salman. Of those 18 Saudis arrested, as Reuters reports, "some were members of a 15-man hit team, many of them Saudi intelligence operatives, who flew into Istanbul hours before Khashoggi 's death, Turkish security sources say." Saudi Arabia is in the process of restructuring its general intelligence agency. On Thursday, the crown prince chaired the first meeting of the committee responsible for that shuffle, according to Saudi state media. In remarks Wednesday, the crown prince called the killing a "heinous crime" and said those responsible must be brought to justice. The New York Times has previously reported that at least one of the suspects is known to be close to the crown prince. And on Thursday, the news agency Anadolu reported that at least four people who have been fired over the killing are "known for their closeness to bin Salman."